I’ll be honest with you, I love making money on the side; always have. If someone gives me 5 bucks for taking a photo, it excites me. Money is, how should I put it, the simplest way to show that my work has been validated. In other words, it’s a way to show that I have been validated. Validation, my friends, is one of the two most important factors for us to continue to do anything. It is our greatest motivator. I know the fad is to pretend that we don’t care what others think of us, but let’s be honest, we ALWAYS care about what others think of us. Maybe not in a toxic way, but in some level, we seek validation from those who matter. For example: as an engineer, I seek validation from my team manager. As a student, I seek validation from my adviser. As a blogger, I seek validation from my readers. When I take a photograph, I seek validation from either the subject or the intended audience. Without validation, we’d lose interest soon enough. Now, the volume of validation required to continue the grind may be different for different people, but validation itself is a requirement none the less. Most of us started a blog because we wanted to create an income stream on the side. For the truly dedicated ones, perhaps it’s a way to replace the current full-time income and get away from the 9-5 grind altogether. For others, blogging is yet another way to reach the ideal customer. Very few start a blog for the sake of blogging alone without any monetary expectation, and even fewer actually continue to do so with that mentality. The hobby bloggers usually stop blogging within a few months or decide to monetize their blog. Don’t get me wrong, a hobby blog (just to clarify, by a “hobby blog” I do not mean a blog about a hobby, those can be quite lucrative actually, but what I mean is blogging as a hobby without any monetary gain) can still have “validation” in the form of a huge fan base, for example. But really, if you have a huge following, whyever would you NOT monetize your blog? The problem with blogging, or with most businesses is this: it doesn’t bring in money from day-1. Not unless you’re a pro. 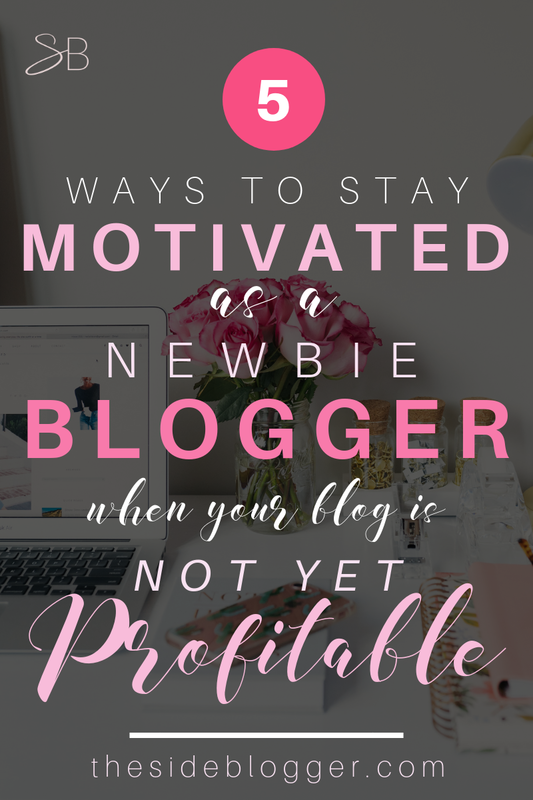 Now, if you’ve had a few blogs and you know the ins and outs of the blogging world, then yes, maybe starting a brand new blog and then monetizing it and making a profit from it is like going through the motions of making the perfect grilled cheese to you. (I’m sure it’s something similar to folks like Pat Flynn or Jon Morrow, the pro-bloggers!) But for us, newbie bloggers, making a profit from blogging ain’t easy. We spend days and weeks and in most cases, months even, without making a single buck while also paying for hosting, domain, the perfect blog theme, email platform, and various other random things that we think we need for our blogs. But you know what I mean, right? It’s hard; really, really hard, to stay motivated when it feels like all you’re doing is spending money on something that has no guarantee whatsoever to, forget making a profit, making it even. And that’s why I’m writing this blog post today. It’s a gentle reminder to all newbie bloggers out there (myself included) that all great things take time and patience and perseverance. The quitter is guaranteed one thing and one thing only: it’s NOTHING! But if you do not quit, and continue to show up, eventually, you’ll be able to enjoy the fruits of your labor. I guarantee that almost as certainly as I guarantee that you’ll be a pro at making grilled cheese if you make enough of them. It’s easier said than done, I get it guys! But you’ve gotta make something… ANYTHING… just so you can tell yourself, so you can justify it to yourself to keep spending all that money on something that doesn’t even make enough during some months to call it even! How do you stay motivated when nothing seems to work? Well, there are a few things that you can do, and a few other things that will likely happen to you if you continue to work on your blog with sincerity, which in turn will help you to keep at it. The blogging game changes every few years because… technology! One of the new players in the world of blogging is called Medium. This is a writer’s and pretty much all wannabe writers’ dream come true! Medium gives us a platform to publish that’s not just our own blog. I don’t know if you can feel the gravity of the whole thing, but guys, it’s HUGE! Everyone’s on Medium these days; starting from Hillary Clinton to Matthew McConaughey to Natalie Portman to the Atlantic to the New York Times… EVERYONE’s ON IT! And you can be on it too. The very same platform as all the big players of the publishing industry as well as the big players in the political arena, and the medical arena and the entertainment arena… you name it. And when everyone’s on the same playing field, it opens up doors to territories previously unexplored. Long intro aside, what I’m trying to say is that Medium is great! And if you like writing (which you must because why else would you be a blogger? And if you’re not a blogger, why are you on my blog? Not that I’m complaining, it’s just that… this blog is kinda for bloggers?!) you should be on Medium. Period. And here’s the coolest part: you can make money off of Medium. Yep! You read that right! In fact, last month I made over $160 on Medium! Now, some of you may be wondering, why then not just blog on Medium? Why bother having a self-hosted WordPress platform? Well, the answer to that is: because Medium has its limits. If you don’t mind writing a ton, and then making a few hundred bucks a month, then sure, go all out on Medium. However, if you want to make serious money, then a self-hosted blog is the way to go. It won’t make money from day-1 but keep at it and eventually, you WILL start seeing green! In the meantime, while you’re waiting for your blog to take off, it doesn’t hurt to write on Medium and make some pocket money while at it. You won’t make a ton, but you can make enough to even out what you spend on your self-hosted blog every month. And that, if anything, should help you stay motivated just a bit longer and continue blogging on your own platform. I know it motivates me! There’s another aspect to writing on Medium. Often, when our blogs are still brand new and no one knows that we blog, it’s easy to lose confidence. Often, you may find yourself questioning whether you’re any good as a writer/blogger. Writing on Medium (and being paid for your content in this platform) can be a huge boost to your failing ego. If you get claps from people and make some money, it means you’re not a failure as a writer/blogger. You just need a little more time and patience. This may not sound like the best advice, especially if you’re losing money, but guys, trust me, it works! At the very least, it keeps you from quitting. For example, imagine investing in a web designer/developer to create a fantastic looking blog. Money aside, just the fact that it now looks effing wicked, should motivate you to continue to blog, right? Also, if you’ve paid for a domain and a whole year’s worth of hosting (most starter hosting packages start with a minimum of 1-year plan, to be paid in full in advance, and this includes my preferred hosting company SiteGround [affiliate]), you may feel that continuing to blog feels a little easier. You may also want to invest in making killer graphics for your blog posts. If you’re not hiring an actual designer to create them for you, then at least invest in Adobe Photoshop ($9), or Canva for Work ($9.95, when paid annually). Canva for Work, specifically, is a great platform for bloggers with an eye for great design, but not enough time to learn a more complicated platform such as Photoshop. Another great investment would be a paid email platform. Even if you’re a newbie blogger with 12 subscribers (and I know it’s very tempting to go with a free email platform like MailChimp), I suggest investing in something more dynamic, such as ConvertKit [affiliate]. I can honestly say that I get 2-5 subscribers on the daily thanks to ConvertKit. The platform itself doesn’t do much to grow this number of course, but it does make it easy to offer multiple opt-in freebies through multiple forms. In short, ConvertKit makes the process easy, which in turn makes me more proactive when it comes to my email marketing strategies. Last but not least, another great investment for bloggers is Grammarly Premium [affiliate]. It’s not Yoda, but it does catch words that you may have repeated one too many times or a word that has a better alternative. A blogger’s job is to get people to read, so it’s not a bad idea to invest in an app that helps do just that, write in a way that makes the reading experience that much richer. Make sure you’re giving and giving and giving to your readers. Do not hold back anything at all. Everything you know, teach ’em to your readers. There will come a day when you’ll have lots of readers, hundreds of thousands of page-views, thousands of email subscribers and followers on Pinterest and social media… on that day, you can worry about creating locked content, paid courses, eBooks etc. But until that day, worry about gaining your readers’ trust. And to that end, you’ll need to prove to your readers that you know what you’re talking about. You can’t prove that if you hold back information. Now, you may be wondering who these readers are when you’re just starting out… after all, isn’t that the whole problem? That you have no audience? OK, so, in this day and age of social media and Pinterest, you can never have ZERO audiences. You have an audience, trust me. It may be that you only get 3 people to click on your content, and that’s OK. Start with these three folks, and eventually, you’ll be able to build from that. My suggestion is that you pick one platform, not 10, and start with that. Personally, I’d say every blogger should start with Pinterest. Right now Pinterest seems to be the primary traffic driving force for bloggers. However, if you feel that another platform would serve you better then sure, go for it. In any case, if you’re on any platform at all, you should get some readers on your blog. Capitalize on that. Make sure those three readers are happy. The rest will follow. Also, when you have happy readers, you may get a surprise here and there which will motivate you further. Thank you so much for blogging! I am doing so much reading trying to figure it all out… your blog makes the most sense to me. I have yet to begin a blog… I hope you will be able to guide me along. I still wasn’t making any money at that time, but guys, that email pumped me up so much… it made me feel like my life had meaning again! And of course, after receiving something like that, there’s no way I was going to up and quit blogging! During those first few months of struggling, you need to focus on the little wins to keep yourself motivated. Make note of every little thing, every single penny made from blogging, every little praise from a reader. 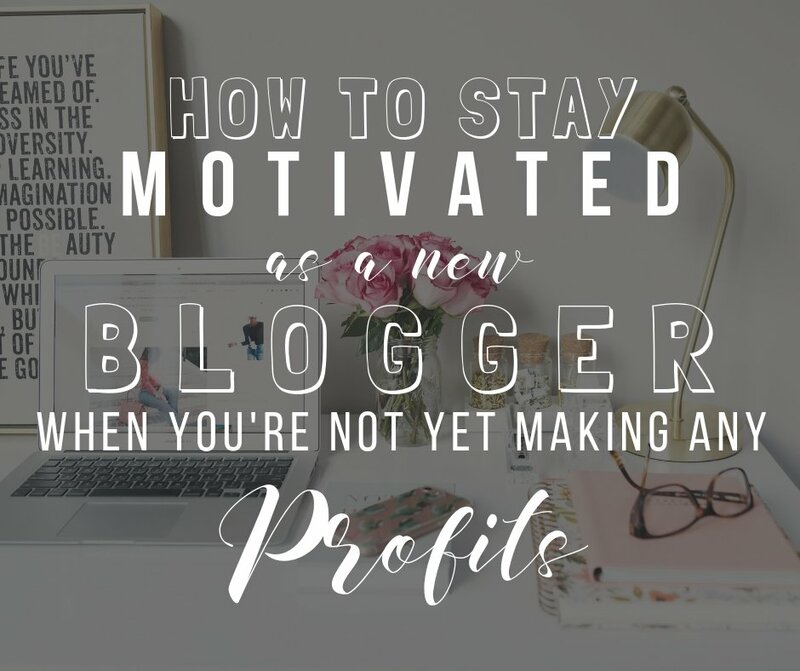 And then, every few days when you’re at your lowest, take out your blogging journal and remind yourself of all the times when blogging totally paid off! Even if not on a monetary level, but at least in spirit. These are just a few, very much attainable, milestones to strive for and make a note of when reached. Jot them down on a notebook or a digital journal, and then bring them out every so often to remind yourself why you keep blogging, and why you must keep blogging. So guys, do you have your own set of rituals to keep yourself motivated to blog on days when the going gets tough? Let me know in the comments below! I love this! Thank you for your transparency. This is something I needed to hear today and you give some great tips! Thank you for this. 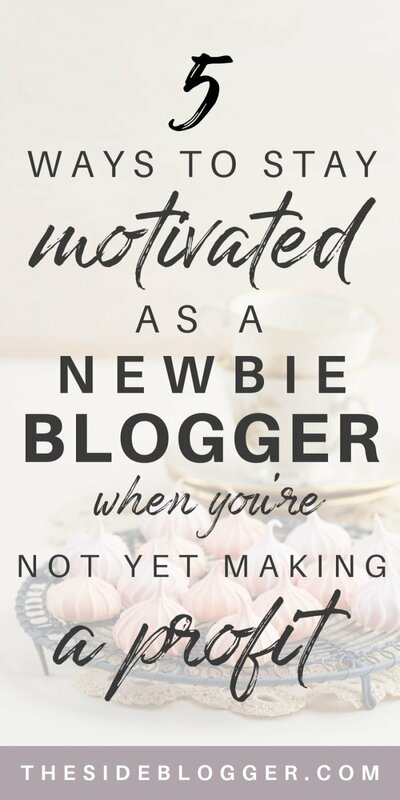 I often wonder if its worth it, do people care….. it’s good to know I’m not alone as a complete newbie blogger and am excited to stick with it knowing it will pay off at some point. Hi Michelle, this happens a lot! I mean, I’ve been blogging for over a decade now, and I’ve had this blog for almost 9 months, and yet, I still feel like throwing in the towel every now and then. But just when I start to feel this way, I either get a comment (like yours) or an email from a reader, or someone buys my product(s). Just stick with it. The first few months are the hardest in this journey. Know that typically, if you’re a brand new blogger with no previous experience, it may take as long as a couple of years to get any result. I often tell new bloggers that the only way to stick with it is to do this because you have fun with it! Not because you want to make money (although money is definitely great, and it has mighty motivating powers), not because you want to help people (of course you do, but when you only think of others, you tend to burn out faster), but because there’s inherently something about blogging that brings joy to your life.